During the Saturday night matchup between the Calgary Flames and Vancouver Canucks, the Flames reached a feat that hasn’t been accomplished by any team in nearly two decades. Five Flames have managed to reach the 70 point milestone this season: Johnny Gaudreau, Elias Lindholm, Matthew Tkachuk, Sean Monahan, and the latest Flame to do so, Mark Giordano. The last team that achieved this prior to the Flames this season were the 2000-01 Pittsburgh Penguins, in which former Calgary Flame legend Jaromir Jagr led his team in scoring alongside Alex Kovalev, Martin Straka, Robert Lang, and Mario Lemieux. These two teams share a rare accomplishment, but how do they compare against one another? To investigate, I am using Point Share Shells as a way to compare scoring outputs between these two clubs. The shells allow for a quick cross-team comparison to understand scoring depth, and comparing these two teams will definitely reveal their similarities and differences. So how did the Pittsburgh powerhouse from 2001 compare to the fiery Flames of 2019? Let’s take a look. For starters, in seven more games played, the Penguins squad put up 781 total points, 55 more points than the Flames currently have. 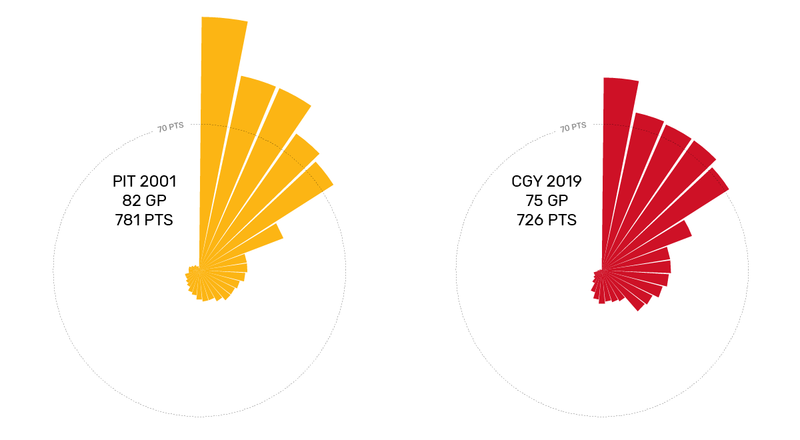 Assuming primary and secondary assists will be given on all remaining Flames goals, they’d have to score at least 18 more goals over their final seven games to catch the Penguins, which is all too likely given the Flames’ firing power. The top trio for Pittsburgh of Jagr, Kovalev, and Straka were in a league of their own, with Jagr scoring a whopping 121 en route to his fifth career and fourth consecutive Art Ross Trophy. Another aspect tying these two teams together would be the fact that Jarome Iginla would next win the Art Ross in 2002. Kovalev and Straka both scored 95 points, which is three more than Gaudreau’s current total of 92. Lastly, Lang scored 80 while Lemieux scored 76. For the Flames, only Gaudreau has broken free of the 70’s, as Lindholm is second on the team with 77 points. Tkachuk and Monahan each have 76 and Giordano’s 72 points puts him into elite company. Support Mark Giordano’s Norris Trophy campaign! There’s virtually no chance that Calgary’s Top 5 will catch Pittsburgh’s, but there’s clear evidence that the Flames have enjoyed something that the Penguins did not: high scoring depth players. Outside of Pittsburgh’s Top 5, the Penguins had one player with more than 30 points: Jan Hrdina posted 43. Their next best players, Josef Beranek and Kevin Stevens both had 23 points, every other player even less than that. Compare that to the Flames, where they have five additional 30+ point scorers, led by Mikael Backlund‘s 46 points. Michael Frolik and Derek Ryan both have 32 points, and T.J. Brodie and Noah Hanifin have 32 and 30, respectively. There’s a non-trivial chance that Mark Jankowski and Sam Bennett (contingent on his health) break the 30 point threshold too; Jankowski currently has 27 points, Sam Bennett has 26. Essentially, Pittsburgh’s top five carried the team with little help from their teammates, whereas the Flames are getting scoring across their whole roster. The Penguins finished the regular season with 96 points, good for third in the Atlantic Division and were the sixth seed in the East. They bowed out of the playoffs in the Eastern Conference final, losing to the New Jersey Devils. The Calgary Flames will look to write their own story this coming spring. They’ve made plenty of history already this season, whether setting franchise marks or a lengthy list of personal bests. One way or another, they’ll be forever tied to the 2001 Penguins for a reason enviable by many other teams. Note that goaltender points aren’t shown on the shells, but Jean-Sebastien Aubin has one assist, and Mike Smith currently has three. All data courtesy of Hockey Reference. Charts made with R using “ggplot2“. Original code modified from R Graph Gallery.